Proc. Roy. Soc. Edinburgh 12: 93 1882-1883 publ. 1884. Origin and Habitat: Euphorbia arbuscula is a succulent euphorbia characterized by an arboreal shape thai is endemic to the island of Socotra (Yemen), and to the other small islands such as Samha and Abd al Kur that are part of the same archipelago. Altitude range: Sea-level to 700 metres. Habitat and Ecology: This species is locally common on Soqotra in Croton socotranus shrubland, succulent shrubland and occasional in drought-deciduous woodland. It is a common emergent plant over most of the island, sometimes planted, and sometimes forms small groves on the desertic plains, but usually only grows in the lowlands. E. arbuscula grows in association with Croton socotranus, Dendrosicyos socotrana, Ziziphus spina-christi, Cissus subaphylla, Adenium sokotranum and combine to form a landscape peculiar to Socotra, other plants commonly foun in the same area comprise Euphorbia nubica, Euphorbia spiralis, Commicarpus sp., Maerua socotrana, Withania riebeckii and Cynanchum linifolium. 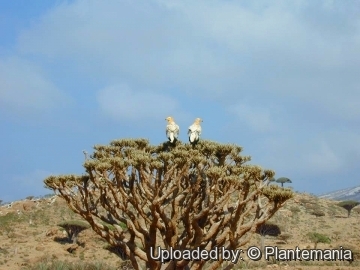 As with many other endemic species on Socotra, E. arbuscula survives the hardest of droughts, and even blossoms in the dry season. On Abd al Kuri there is a small but flourishing colony. Here goats do not browse the young plants and trees are found at all stages of growth. The small population on Samha shows no signs of regeneration. On Soqotra low and windswept forms occurring at higher altitudes have been called var. montana. Trees are planted near settlements as dry season fodder for livestock. If livestock numbers increase greatly, or a succession of drought years occur, it could rapidly become threatened in some areas. The small populations on Abd al Kuri and Samha are particularly vulnerable. Euphorbia arbuscula var. Montana Balf.f. 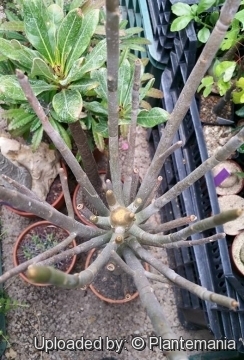 Description: Euphorbia arbuscula is an impressive leafless shrub or broad-crowned candelabrum tree 3-7 m high that produces a white resinous exudate when cut. It is a succulent plant without real leaves, where the photosynthesis is guaranteed by the green parts along the tips of the branches. The mature specimens are gorgeous trees that provide shade from the scorching sun, as the dense crown has no leaves to shed. Irregularities in the shape of individual, especially aged, trees are due to traumatic events which change the vitality of one or more branches. The fruits are brown. It is rarely cultivated. Derivation of specific name: arbusculus,-a,-um; from Latin arbusculus (from Latin arbus, tree), small tree: shrubby or becomming a small tree. Stems. Branches, neither spiny nor thorny, grey-green to blue-grey, with grey bark. Branchlets somewhat whorled or alternate, gracefully curved upward, cylindrical or somewhat compressed, jointed. Similar species: E. arbuscula trees (section Tirucalli within the genus) resemble in shape Euphorbia aphylla from the Canaries very much. 1) Miller, A. 2004. Euphorbia arbuscula. The IUCN Red List of Threatened Species 2004: e.T37869A10082664. http://dx.doi.org/10.2305/IUCN.UK.2004.RLTS.T37869A10082664.en. Downloaded on 22 December 2016. 2) Carter, S. and Eggli, U.“The CITES checklist of succulent Euphorbia taxa (Euphorbiaceae).” German Federal Agency for Nature Conservation. 1997. 4) Oldfield, S., Lusty, C. and MacKinven, A. (compilers). “The World List of Threatened Trees.” World Conservation Press, Cambridge, UK. 1998. 11) Mies, B. A. “On the comparison of the flora and vegetation of the island groups of. Socotra and Macaronesia.” Bol. Mus. Munic. Funchal, Sup. 4: 455-471. 1995. Cultivation and Propagation: Euphorbia arbuscula is an easy species to grow though slow growing. It is suited for any well drained soil in full sun. But young plant are happy growing indoors, where they can easily reach the ceiling. Give the plant an airy growing medium which mainly consists of non organic material such us clay, pumice, lava grit, and only a little peat or leaf-mould. Water regularly during the active growing season from March to September. No water should ever be allowed to stand around the roots. Keep almost completely dry in winter. Only downside is from strong winds, the columns often smash into each other, causing permanent scarring... best to plant in such a location where winds are not a big issue. It is a relatively long lived plant and once established, it will be content in its position and with its soil for years. It can tolerate moderate shade, and a plant that has been growing in shade should be slowly hardened off before placing it in full sun as the plant will be severely scorched if moved too suddenly from shade into sun. Like quite small pots, repott in very later winter, early spring. Can be pruned for shape and branching. Frost tender, frost free zones only. Plant Pests: Prone to mealy bugs and rarely scale. Propagation: Seeds. It is also easy to propagate by cuttings in late spring to summer, just take a cutting of the plant let it dry for 1 and stuff it in the ground (preferably dry, loose, extremely well draining soil). Use: It has a milky sap which is poisonous and can burn the skin, so please be careful. It is an endemic tree that provides glue, caulk for wooden boats, fish poison, pesticides, drought fodder and medicine. It also provides nest sites and food for birds. 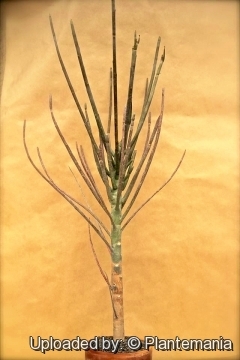 E. arbuscula appears to be a strange plant to use as fodder, as it responds to the least injury by pouring a caustic latex which burns the skin. Indeed the herder harvest the tree covering himself with sacking as protection. 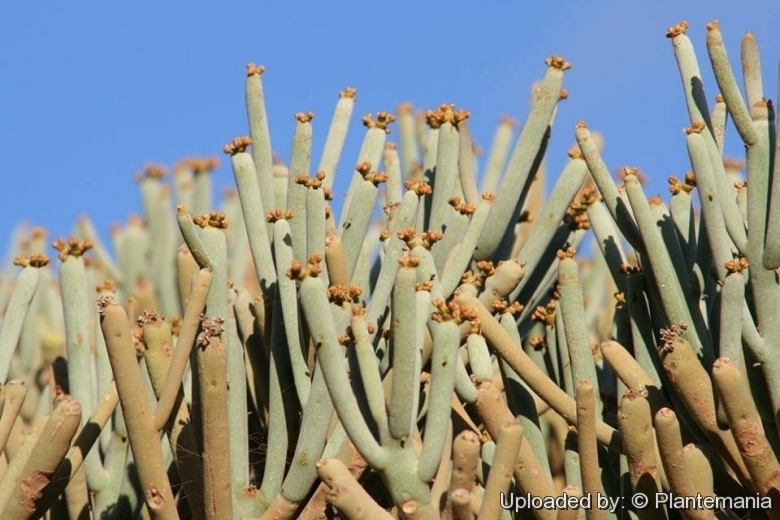 Despite this the succulent stem-joints are readily eaten by the hungry goats both when they are fresh and green, and later when they have been dried out. Beware: The milky sap contained in this plant is extremely irritating to the skin and mucosa and possibly toxic. If swallowed, it may cause burning to the mouth, lips, and tongue. Contact with skin causes severe irritation, redness and a burning sensation; contact with the eyes may cause severe pain, and in some cases temporary blindness for several days. Symptoms may worsen over 12 hours. For eye exposures, flush eyes with fresh, cool water for at least 15 minutes and repeat after a few minutes. Seek medical attention if there is no relief. Over-the-counter anti-histamines may provide relief for some people.